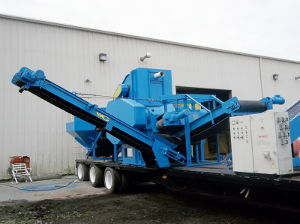 The Eldan line of equipment has been a top manufacturer of tire recycling equipment for over 55 years. The Eldan 122T Rasper is a heavy duty machine ideally suited for the harsh application of tire granulation. It was being used to take 15mm material down to 30mm, and will produce about 2 ton of material per hour. The machine is being completely rebuilt with the seals being replaced, as well as the cassette deck. The knives are in like new condition and the machine is set up with an infeed and outfeed conveyor, infeed hopper, crossbelt magnet, and a steel discharge conveyor. The control panel will be completely rebuilt with all new wiring and the switches and relays are in very good operating condition.